NEW YORK: A new study from the National Wildlife Federation takes a closer look at how schools deal with the millions of textbooks in the United States that become damaged or outdated every year.Researchers surveyed both K-12 and higher education institutions on their recycling practices, with emphasis on textbook recycling. More than 57 percent of the K-12 schools surveyed said they participate in book donation programs for obsolete textbooks, and 37 percent store damaged or obsolete books because they are unsure how to dispose of them. Over 50 percent of the K-12 school respondents felt that textbooks are under-recovered for recycling. Higher education survey responses also indicate the need for more information on textbook recycling. Over 36 percent of higher education survey respondents said that textbook recycling was available on campus, but 33 percent were unsure whether or not their campus recycled textbooks at all. 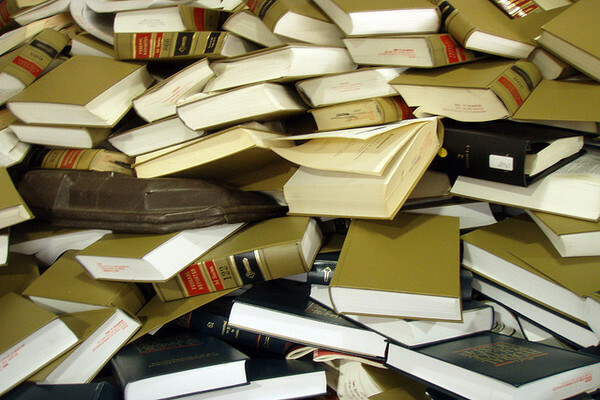 “Our original assumption was that recycling books would be relatively easy,” the report states. “But our research indicates that it requires discipline, structure, organization, an outlet and method for disposal and processing of books, and a change in behavior when it comes to educating the public about the reyclability of books.” The National Wildlife Federation study, which was funded by a grant from the McGraw-Hill Companies, recommends steps that schools can take to increase education and knowledge on book recycling. The study suggests schools work with facility councils, solid waste organizations and recycling organizations to incorporate textbook recycling into their training programs, as well as to spread the word on textbook recycling to school communities. “Most schools are used to recycling paper, but they are not necessarily versed in the best practices related to recycling books,” the report says. The U.S. Environmental Protection Agency’s report on municipal solid waste in the United States indicates that approximately 640,000 tons of books were discarded into landfills in 2009.